Top Chief D C…..Season 7……. Top Chief does Washington DC……..
Top Chef has announced its contestants, judges and some details on the seventh season of the series, set in DC, and airing beginning June 16. The most interesting news: Eric Ripert of Le Bernardin in New York joining the longstanding judging panel of Tom Colicchio, Padma Lakshmi and Gail Simmons. See who that might be — More…….. The 17 new cheftestants come face to face in the nation’s capitol for the ultimate power play that will determine just who has the chops to become Top Chef. This season captures the varied tastes of Washington D.C. and features appearances by some of the town’s top names including Apollo Astronaut Buzz Aldrin, Speaker of the House Nancy Pelosi, White House chef Sam Kass, MSNBC host Joe Scarborough, Congressman Aaron Schock of Illinois, Senator Mark Warner of Virginia, CIA Director Leon Panetta and NBC White House Correspondent Savannah Guthrie. The challenges featured will be some of the most creative and inventive yet……..
Immigration?…..does it have any chance in Democratic Senate without 60 votes? In a conference call with reporters this week, representatives of a range of religious groups were joined by two members of Congress to unveil a month-long campaign that will begin by delivering thousands of postcards to Capitol Hill offices, continue with some 100 events across the country during the President’s Day recess and into early March, and culminate with a large immigration reform rally in Washington on Sunday, March 21. The goal is to use both moral suasion and practical arguments — that immigrants bring value to the American economy and are not competition for scarce jobs — to change a legislative dynamic that seems even more daunting than in 2007, when a promising bill co-sponsored by John McCain and Ted Kennedy and supported by President Bush died in the Senate in the face of Republican opposition. Now Kennedy is dead, McCain is tacking right to save his political life, and the economy has tanked while Tea Party rage is on the rise. So what makes faith leaders think they can move the mountain now? They are taking a two-pronged approach: to change hearts and minds by framing the debate as a “moral imperative,” and to deploy some old-fashioned political organizing and lobbying. “We should not be wasting time with friends who don’t need to be converted,” echoed Rep. Mike Honda, a Democrat who represents California’s Silicon Valley. The interfaith coalition, which represents mainline and evangelical Protestants, Jewish groups, and the Catholic hierarchy, knows it has an uphill battle. For religious leaders, the Judeo-Christian ethic, as based in scripture, is clear: welcome the stranger, strengthen families, care for the needy, do justice to one’s neighbor. And in legislative terms, that means supporting immigration reform that allows both legal and undocumented people a path to citizenship, that focuses on keeping immigrant families united, and that brings security and consistency to border enforcement. But polls consistently show immigration reform is a relatively low priority for most Americans, and according to a survey from the Pew Hispanic Center last year, just 31 percent of Latinos said it was an “extremely important” issue for President Obama to resolve. 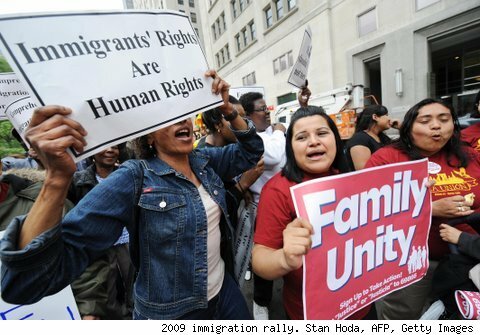 Jobs, education and, yes, health care reform, are higher priorities, and immigrants — especially the 11 million undocumented immigrants estimated to be living in the United States — are increasingly seen as threats to the economic well-being of native-born Americans, even while the number of illegal immigrants has fallen significantly in the last year. The Dog is not sure that Immigration is going to get to the table this spring…..With the pipeline clogged as is with Healthcare, Jobs and the Economy…ther isn’t much room for Immigration…also the fact that the Republicans will surely put up a fight on the issue means that President Obama will not have the stomach to push the issue…..Like Healthcare…this issue needs to be addressed…but will in all likelihood be put on the shelf……..Like it or not the GOP now is a factor….. The people of the nations capital have been trying to get right to vote (The Districts House member, Eleanor Holmes Norton, does not actually have the right to cast a vote in Congress) for a long time……they thought they might get there with a tack on to the current Defense Spending bill being reconciled by the House and the Senate right now…..But that’s not gonna happen….Why? So the District still has the ability to regulate gun ownership……something the NRA is against..
So….The District’s right to vote remains held hostage to the NRA……..
More Real Houswives coming next year……..
Bravo has added another show to start next year, based in Washington DC………. The new Healthcare provider….Your local Fire Department……. The fire fighter’s gripe that they joined the fire service to fight fires but, they actually spend almost every hour of their twelve hour tour of duty assisting the sick, and the ill ( along with the districts EMS units). Almost no one recognizes this aspect of the healthcare issue, and I’m glad someone reported on this………..